Do you live in Coevorden? JMD Web Reviewed by: Sophia Zeer goede service van begin tot einde. Altijd klaar om u te helpen. Sterk aanbevolen deze website bouwer in utrecht. copyshop Reviewed by: Rataangepay Quickly helped me with a rush order, thanks. Coevorden is a municipality and a city in the northeastern Netherlands. During the municipal reorganisation in the province in 1998, Coevorden merged with Dalen,Sleen, Oosterhesselen and Zweeloo. 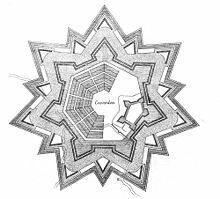 Fortification plan of Coevorden, in Star fort style. Coevorden received city rights in 1408. The city was reconstructed in the early seventeenth century by Maurice, Prince of Orange to an ideal city design, similar to Palmanova. The streets were laid out in a radial pattern within polygonal fortifications and extensive outer earthworks. The city of Coevorden may have indirectly given its name to the city of Vancouver, which is named after the 18th-century British explorer George Vancouver. The explorer's ancestors (and family name) may have originally come to England "from Coevorden" (van Coevorden > Vancoevorden > Vancouver). There is also a family of nobility with the surname van Coeverden, sometimes spelled with a K (as with Canadian kayaker Adam van Koeverden). Its name (Coevorden) has the same literal meaning as of "Bosporus" and "Oxford" - "cow ford(s)" or "cow crossing".